Pop Up Food Trucks are generating lots of interest these days - just look at the queues of patient customers waiting around the city for their carefully crafted gourmet grub. Veggie Velo, La Cantina Co and Burger Theory have all been in the news lately, and I predict Smooth Revolution will be too. 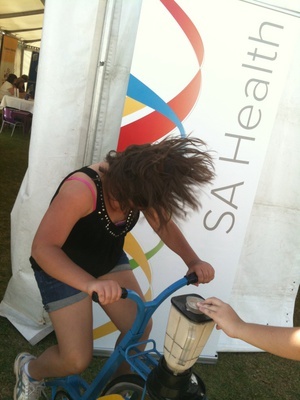 initiatives such as OPAL (Obesity Prevention And Lifestyle) aimed at children and Healthy Communities (for adults). James concentrates on serving delicious organic smoothies, soups and the occasional dip. They are made using ingredients such as Bio-Dynamic Paris Creek Farm full cream milk, local organic raw honey, local organic stonefruits, local organic avocados and delicious mangoes from our very own riverland in South Australia. He has recently perfected a new range of energy pumping superfood smoothies that don't have the awful come down effect that energy drinks do. Ingredients include raw cacao, Goji berries, chia seeds, spirulina, maca powder and mangosteen powder. The food is delicious, healthy and you can trim your thighs in the process of making it if you pedal your own smoothie (save yourself a dollar too). It only takes 30 seconds and it's carbon tax free! Smooth Revolution has been mobile since 2011 using a long bike and trailer to tow around everything needed to set up a pop up stall. 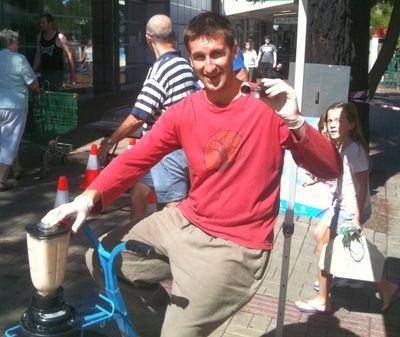 (Last year he was serving smoothies alongside Burger Theory in Hindmarsh Square @ the Bike SA Bike Park). 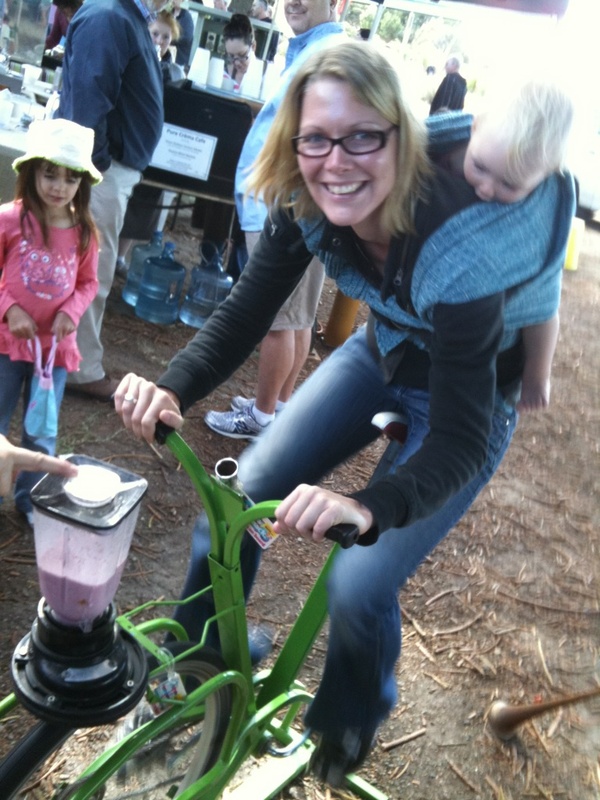 The DIY smoothies are made with on an exercise bike which is available to customers. People can like the Facebook page and get alerted where he will be in the city this summer. There is also a website, but the Facebook page appears is far more informative. James is currently in Far North Queensland visiting properties that grow and supply the fruit for smoothies - bananas, mangoes, papaya, pineapples and many other exotic tropical fruits. He will be serving delicious fresh coconuts again this summer, that are naturally preserved not with formaldehyde. powered smoothie maker for the Real Food Network. 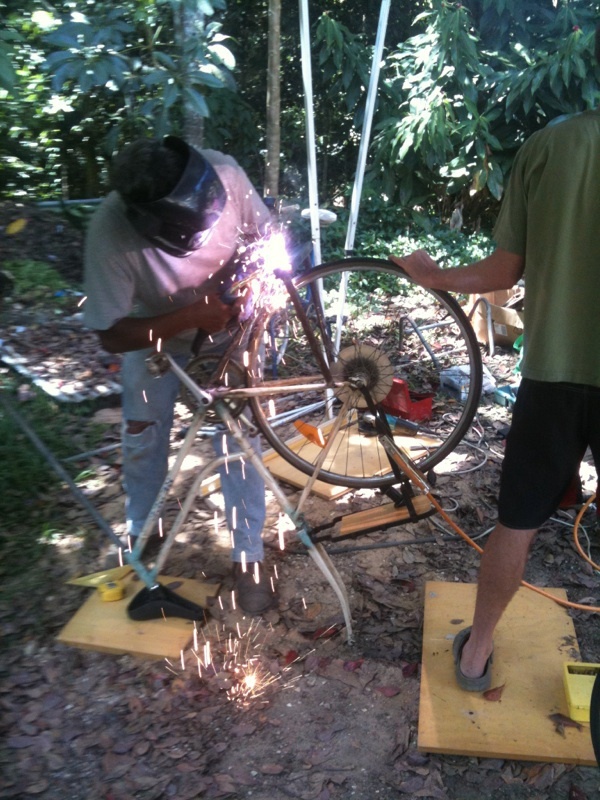 The goal this summer is to begin building bikes and getting them out to Indigenous Communities in South Australia and Queensland to promote healthy eating even more widely. The business is modelled around permaculture principles. All waste is recycled and composted. Local food is used wherever possible. Green energy. Food picked up with pedal power. No refined or processed foods. He also tries to make the experience with the food interactive and fun, specializing in community engagement and making a party happen. 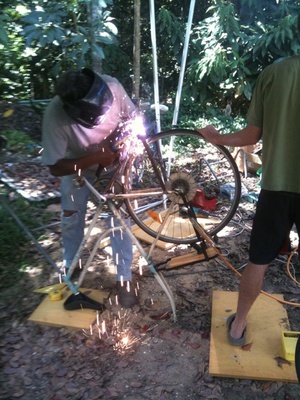 James will be back in town soon, so like his Facebook page and get on your bike for a nutritious feed soon. Cost: Varied depending upon fruit used. Got to say I have never heard of these guys before. You did not mention how they taste... I presume you have not had them? I've shared this on FB...awesome idea...maybe improve on the comic routine tho - ha ha! Fantastic! I'd never heard of James before, but I must admit, I'm looking forward to Summer and pedaling my way to a refreshing smoothie! What a great story - definitely worth getting the word out about this business! Tried two different smoothies - 1. chocolate one and 2. mango with chia seeds. The chocolate one was yum. The mango one was interesting; it got much thicker towards the end of the drink and started to acquire a slight bitter taste. It had alot of texture from the pineapple and chia seeds. Overall, it felt like a really wholesome and healthy smoothy. The smoothies are nice and thick and absent from ice like the ones you get from Boost Juice which can end up diluting your drink. Cycling for your own drink is an ingenious idea. It was fun. I did not see anyone who didn't do their own cycling. Also, James was also very informative about the ingredients he used in making his smoothies and what properties they had for general wellbeing.